It’s been a long, busy, tiring week. 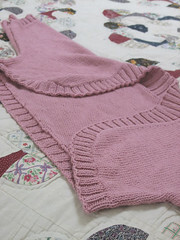 I had no time for knitting nor blogging. Work was emotionally and energy draining. I ordered a lot of dinners to tired to cook and have gone to sleep early (except for Thursday*). There was just no time. So on this beautiful and unseasonably warm Saturday morning, I awoke and realized: I have time. Boleroooooooooooooo! I get so impatient when making a top like this. I’m constantly trying to wear it before it’s done just to see if I’m on the right track. Even then I could never truly get a good idea. So when you get to that moment, when it’s all seamed up, when you slip your arms in the sleeves and turn to the mirror, it’s just so wonderful when you see something so simple and beautiful back. I made the second size up and I did have some row gauge issues but with some encouragement I made some adjustments and knitted on. On the whole this was pretty mindless knitting. The shaping was pretty straightforward and there was a lot of straight rows. A great TV watching knit. Things got a bit tricky when I got to the ribbing. I began picking up stitches and realized I was closer to the smallest size directions than the size I was knitting. I just decided to follow those instead and I think due to the lack of rows (off row gauge) it worked out perfectly. Ahhh… the beauty of knitting, even if it doesn’t quite match you can do a little ad lib and sometimes things come out right. Great Pattern, Great Yarn all equal a Great many times this will be worn. The Bolero looks great! 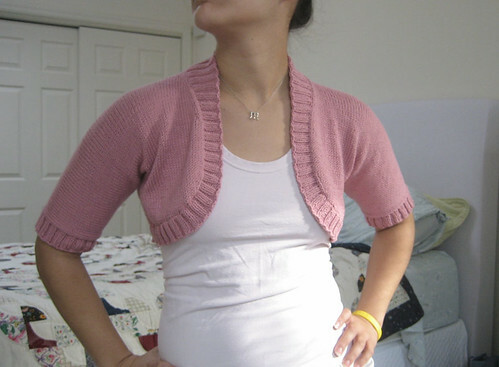 I just finish a similar one, Debbie Bliss’ Cathay Shrug, which is almost exactly like yours but longer sleeves. Hmmm, I think I might have to make one in pink someday! That is awesome, great job. I think its super cute, I enjoyed reading your blog too. Very beautiful Margaux! having it finished kind of (almost kind of) helps you to forget those very very very long back rows, doesn’t it? Fab. Es precioso. Me gustaria hacer uno a mi hija. Tienes el patrón? Me gustaría que me ayudases. Gracias.